Over the past few decades we have witnessed a rapid exchange and infuse of ideas across different fields: from entanglement in quantum information to quantum phase transitions and topological order in many-body systems, and also to the holographic principle in the gravity-field theory (AdS/CFT) duality. A very useful framework that emerges from behind the curtain is that of tensor networks. Tensor Networks (TN) are rapidly evolving as an important tool and language and are employed by researchers of various different fields. The simplest TN is the one-dimensional matrix product state (MPS) or finitely correlated state and is the fixed-point form that the density-matrix renormalization group (DMRG) converges to. DMRG and variational MPS algorithms are very efficient in dealing with one-dimensional and quasi-one-dimensional gapped quantum systems. Besides the algorithmic advantage, the MPS formulation has been utilized in the complete classification of one-dimensional gapped systems. The Mutli-scale Entanglement Renormalization Ansatz (MERA) and its generalization can cope with one-dimensional gapless systems and is able to obtain, for example, the central charge of a CFT, scaling dimensions of primary and quasi-primary operators, as well as the operator-product coefficients. The Projected Entangled Pair States (PEPS) or tensor-product states were a generalization of MPS to two and higher dimensions. They embody the entanglement area law and have been used variationally to approximate ground state wavefunctions. They can also be used to represent topologically ordered states, such eigenstates of the toric code and string-net models, as well as chiral topological states with a nonzero chiral central charge. In fact the classification of intrinsic topological order and symmetry-protected topological order can also be described in the same framework of PEPS. In order to compute physical properties, such as energy and other local observables, the corresponding tensor network needs to be contracted. Methods using real-space renormalization procedure, such as tensor renormalization group (TRG), higher-order TRG (HOTRG), corner transfer matrix (CTM), and more recently tensor network renormalization (TNR) have been proposed and were also successfully applied. 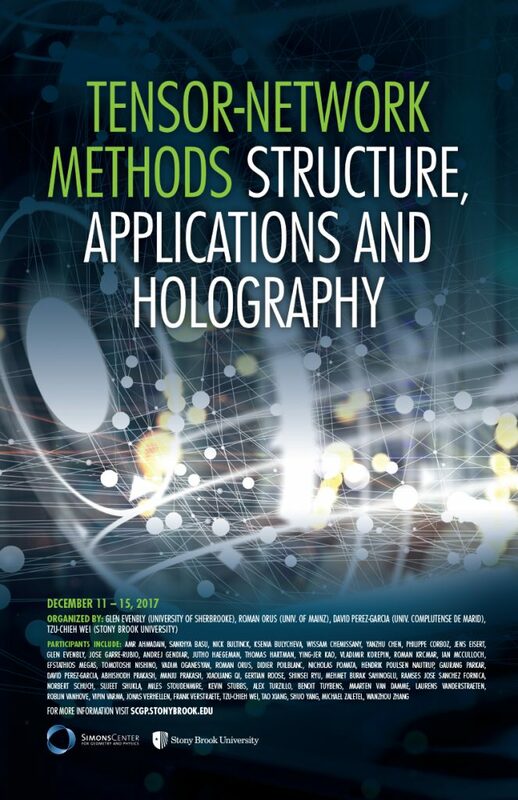 Among many recent developments, the connection of TNs to holography is particularly interesting. It was proposed that MERA or a generalization of such tensor network is a discretized version of the AdS/CFT correspondence and a manifestation of the holographic nature entanglement, which may play a central role in a consistent theory of quantum gravity and emergence of spacetime. Other toy models for such bulk-boundary correspondence have been proposed using holographic quantum error-correcting codes, and using perfect and random tensors. At such an exciting juncture, this proposed workshop aims to bring together experts in various related fields, and under such an embracing theme of tensor network the scientific activities and discussions in this workshop will generate further novel ideas linking different fields.